Welcome to the web page of our transfers from Milan Malpensa airport (MXP). Here you will find all our Milan Malpensa airport transfers using the Milan Instant Quote above; by selecting your destination, number of passengers and arrival time you will have your Malpensa transfer quoted in just a few minutes. It will be possible to book it in just a few steps thanks to the SSL technology which encrypts all the entered information before they are forwarded our server. Thanks to our fleet, consisting of luxury cars, vans, minibuses and buses for large groups, we can meet all your travel needs, making travel safely and comfortably. Once you book your transfer from Malpensa airport, we will send you an email with the phone number of our driver and all information about the meeting point. Our driver will wait for you at Milan Malpensa airport holding a sign with your name, he will help you to carry your bags until the car and bring you to your destination. Our manager will monitor your flight so that if it is in delay your booking will be updated according to the new estimated arrival time. 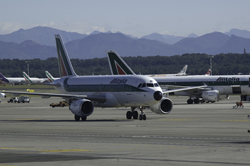 All our transfers from Malpensa airport are private and door-to-door. We are also specialized in transfers for individuals or large groups from Milan Malpensa airport to the most important ski resort destinations such as Champoluc, Cortina d'Ampezzo, Courmayeur, Gressoney La Thuile Livigno, Santa Caterina Valfurva, Madonna di Campiglio Ortisei Canazei, Selva di Val Gardena, Saas Fee Sauze d 'Oulx, Sestiere, Sondrio, St Moritz and many other destinations. If you don’t find your destination in the list of Milan Instant Quote you can email us, we will reply immediately by sending you the price of your trip.